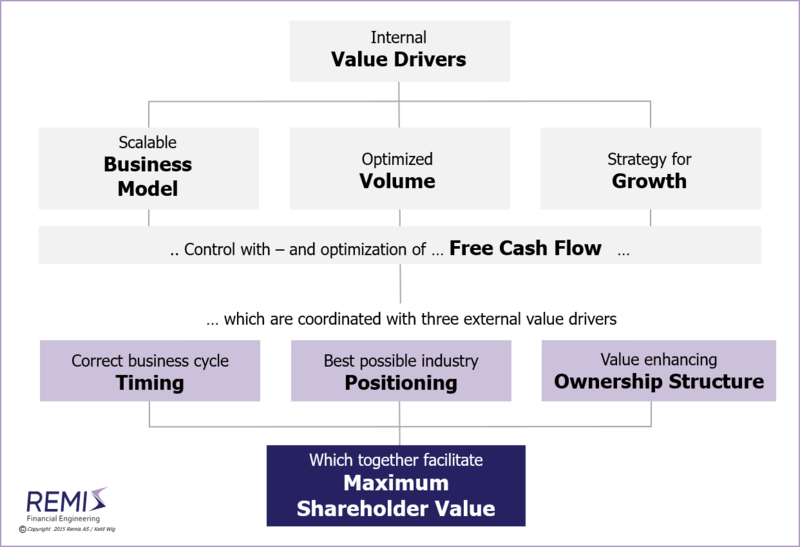 Corporate Finance includes a set of project types related to ownership strategy development, valuations/bid scenarios, equity splits/de-mergers, negotiations between shareholder groups, and capital optimization projects. Valuations are rarely executed on a stand-alone basis, but rather as a necessary and important part of bid evaluations for acquisitions or divestitures/trade sales of non-core assets, or as a basis for negotiating de-mergers. Several equity split projects/de-mergers have also typically been characterized by successfully managing complex negotiations and building dialogue/creative win-win solutions in situations characterized by owner conflict and distrust between shareholder groups or board members. A separate corporate finance specialty has been to work directly for corporate boards in evaluating and implementing advanced ownership strategies, characterized by combining various measures such as protecting against external takeovers, locating alternative buyers, tightening up internal agreements and shareholder protection schemes, refinancing, building a more robust equity structure, etc. Usually, all of these actions are combined into an "integrated package." Also read the separate article on Strategy and the Use of M&A, on Strategic Alliances and Joint Ventures, on Buy-Side M&A, on Sell-Side M&A, on Synergies and Poor Judgment, on Financial vs. Industrial Ownership, on Developing High Quality Business Models; on Equity Based Financing of Start-ups, and about M&A Process Management. See Download Center: White Paper #1: Post-Merger Integrations - About Synergies and Poor Judgment; White Paper #2: Strategy - and the Proper Use of M&A Tools; White Paper #5: Buy-Side M&A (mergers and acquisitions); White Paper #6: Sell-Side M&A (divestitures, trade-sales and mergers); White Paper #7: Should You Choose Financial or Industrial Investors/Owners? ; White Paper #8: The Funding Journey - on Equity Based Financing of Start-ups and High Growth Situations; or White Paper #9: A 15 Step Recipe for Developing Your High-Quality Business Model.